The Wiggin’ Out Foundation received a $11,057 check recently from Lincoln ACHIEVE, the Ruston-Lin-colnChamber of Commerce and Lincoln Parish Schools. The money raised came from the first service project by the Adopt-A-School program that helps support breast cancer awareness, said Cathi Cox-Boniol, Lincoln ACHIEVE coordinator “We are tickled pink to be presenting this check,” she said. The money raised goes toward North Louisiana cancer patients going through treatment who cannot afford a wig or have other needs, said Elizabeth Turnley of the Northern Louisiana Medical Center. “We even were able to donate a mustache to a patient this year as well,” she said. A check like this will support the foundation for a couple of years, carrying on until 2017-18 depending on the number of applicants, said Vicki Caskey, of Minute Magazine and the Wiggin’ Out Foundation. The money will also go toward future programs Wiggin’ Out may want to create — though there are no future plans yet. “Ultimately, we want to make sure we expand our mission,” Caskey said. “We want to reach our goals, help those in need and this money will be able to provide those needs.” This is not the first donation to come from the Adopt-A-School Program, said Cox-Boniol. 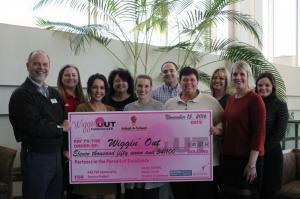 Last year, a check for $11,300 was presented to the board of directors of Wiggin’ Out, which was used to help fund the Foundation as well. “It makes me happy knowing that, if the Wiggin’ Out Foundation needs funds, they do not have to worry about going to the bank to find they do not have the right amount of money to support their mission,” Cox-Boniol said. The money was raised during community projects at Lincoln Parish Schools, Cox-Boniol said. Events ranged from paying to wear jeans during school, crazy wig day or teachers participating as well. “And the best thing about that is, it raises awareness about cancer,” she said. “I want them to be well-informed citizens. This helps raise them up in the right way. ”Marisol O’Neal, of Origin Bank, said the money also goes toward Wiggin’ Out’s annual gala, which is also a celebration of patients receiving wigs. 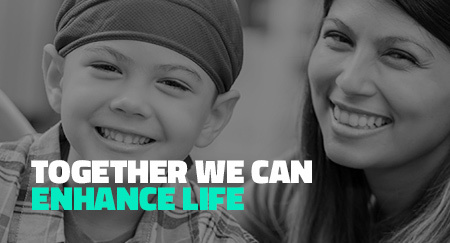 “It’s a big celebration that also celebrates our patients surviving cancer,” she said. “That money helped us make a more extravagant gala this year.” This program, along with other programs with Adopt-A-School, shows how collaboration in the community can benefit all, Cox-Boniol said. “And that’s why we continue to do what we do,” she said. Copyright © 2019, Wiggin' Out. All Rights Reserved.